Today’s post isn’t really pumpkin per se. I have leftover candies I needed to use up. It fits the autumn theme, sort of… and it’s easy. It’ll have to do. Have a great week! Preheat the oven to 350 degrees F. Line a large baking sheet/pan with parchment paper or Silpat. Using a stand or electric mixer (or mix by hand) combine sugars, flour and salt. Then add egg, vanilla extract and peanut butter and mix until incorporated. Using a small cookie scoop (about 2 teaspoons) or use your hand and shape the dough into 1 inch balls. Place each ball on the cookie sheet. If the dough is too sticky, refrigerate for 1/2 hour or until it’s easy to handle. Bake for 10 minutes. Remove cookies from the oven and let it cool for 5-8 minutes. Press a pumpkin spice kiss into the center of each warm cookie then transfer to a cooling rack. Those crumbly kiss-cookies are so kissable! How I crave to kiss ’em and eat ’em all ! Love these, Anne!! Thanks for such fun and great looking idea! Anne, I love these! There is nothing like the combination of peanut butter, pumpkin and spice. Love it! 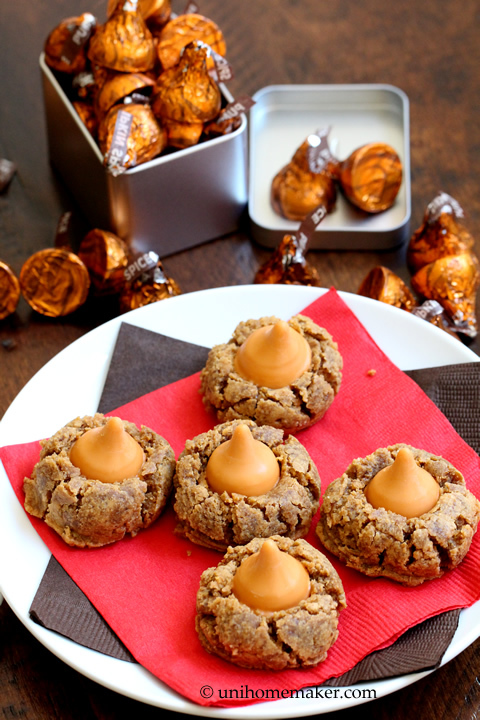 Such a cute variation on classic Hershey’s kisses drop cookies, and in the spirit of the season. Thanks for sharing! Love this pairing, Anne! Just perfect for autumn and Christmas. I hope you’ve had some time to relax and enjoy your Sunday. Thanks for sharing! They look melt-in-mouth and gorgeous! These cookies are so cute and I bet they are really tasty, too! 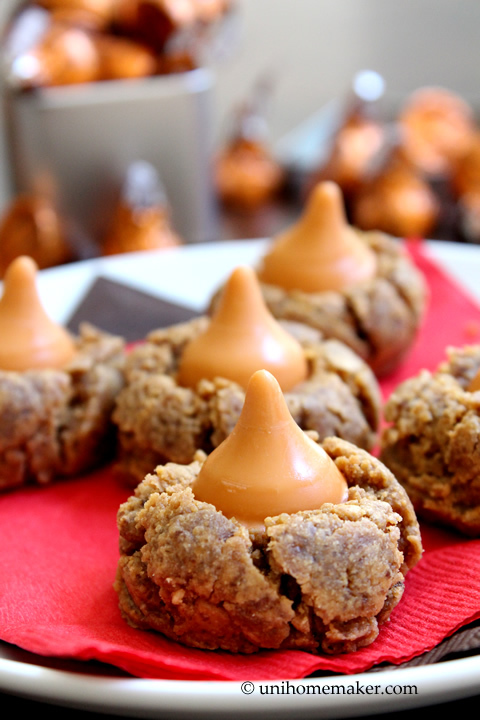 I love peanut butter blossoms, especially with these pumpkin spiced kisses! I love road trips! And, yes this month is flying! I love how you made these “spiced” cookies…putting these on the cookie list for the neighbors! 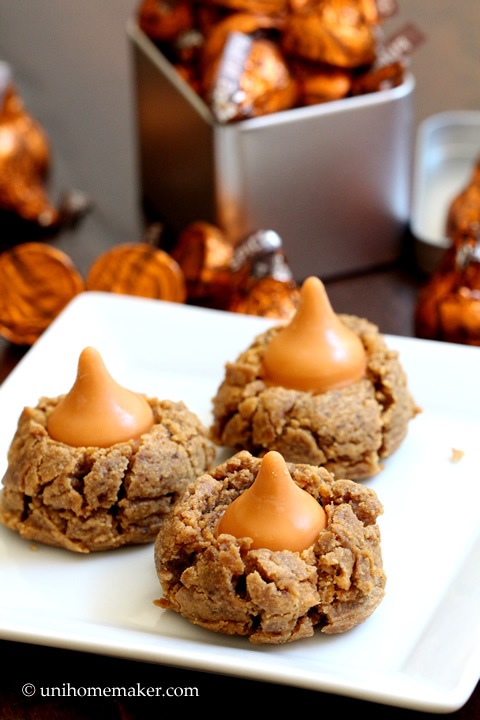 I love the combination of peanut butter and the pumpkin spice kisses! It’s hard to believe fall is almost over. Seems like it just began. Gosh, these look wonderful! Great flavors, fun cookie. Gotta make ’em! Thanks so much. Welcome back Anne! Boy, that recipe title is quite the mouthful, lol…Of course the recipe is a wonderful mouthful too. I do believe I still have some leftover kisses. This may just be the perfect nibbler for the kids that are coming for Thanksgiving. These definitely make me think of autumn. Great use of leftover candy, too. Your road trip sounds like fun…hope you have a great week ahead! I wish I could taste these, and the pumpkin spiced kisses! I’m always super jealous of the kinds of candy you have in the US. Pumpkin spice kisses. Man! Ooh, these sound fantastic! I need to get my hands on some of those kisses – they look delicious! Such a great idea, Anne. I could devour one or two (or three!) with my cup of tea right now! They look delish. I love anything with pumpkin! Welcome Back, Anne! 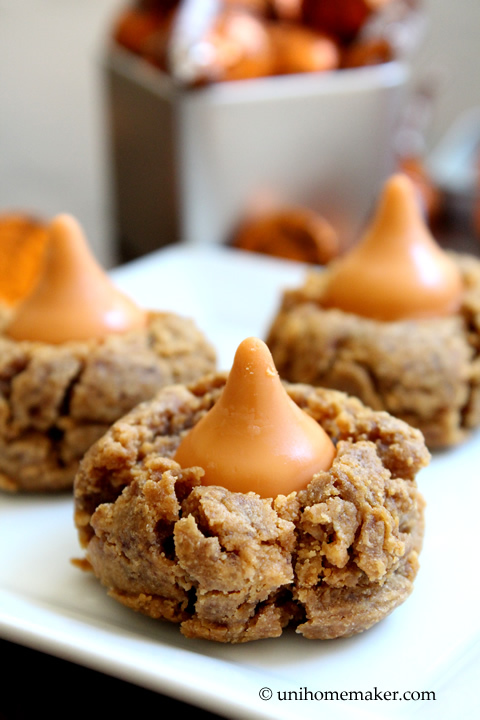 The pumpkin spice kisses are a perfect choice for your peanut butter thumbprints. Cute as can be too! These cookies are so cute! And what a great flavor combo – I bet they are just delicious! They look terrific and my kids would LOVE them! It’s really crazy that November is already half over…where has the year gone?! These cookies sound amazing. My mother-in-law makes those pb kiss cookies with regular chocolate kisses at christmas, but I LOVE this twist. I need to find those pumpkin spice kisses!!! Now THIS is a peanut butter cookie. I love that you used so so much peanut butter in these. They look incredibly moist and gooey — just the way I like ’em! These are a great way to use up leftover candy! Plus, I can never ever say no to a peanut butter cookie : ) Like ever. haha I always hate the catch-up part after taking a trip – no fun! I love the combination of peanut butter and warm, spicy fall flavors! These cookies look like the ultimate fall treat! Lovely job, Anne. Very clever idea, and so cute. I love simply recipes and flavors like this. These are perfect for fall, and a little bit unexpected! Peanut butter and pumpkin = totally meant for each other! What cute cookies! I’d love to sink my teeth into a few of them! Love the peanut butter and pumpkin combo! Plus the fact they’re totally adorable too. Hope your week is going great! Very creamy and delicious.., I am drooling over this pumpkin peanut butter. bookmarked and must try! Clever and delicious idea. The photos make me go: squeeee! 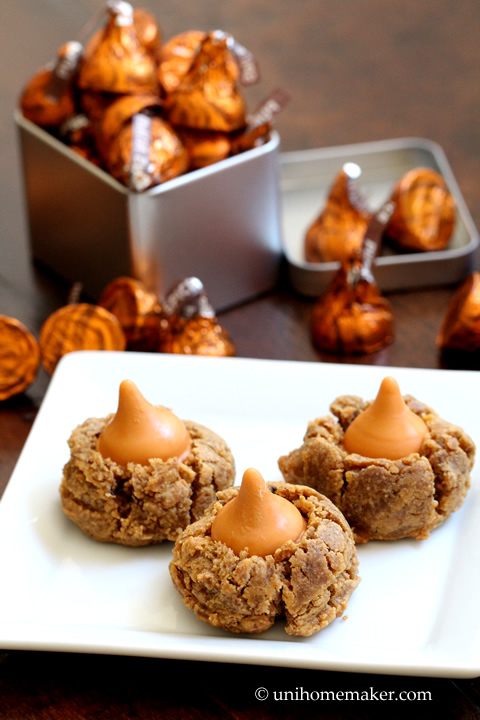 I forgot to tell you that this post really makes me wish I was in the US and can get baking ingredients like these pumpkin kisses. These, and butterscotch chips, look like so much fun! Great recipe, I’ll give it a go with a substitute for pumpkin kisses. Anne, I hope you enjoyed your road trip! I am very happy that you decided to make these when you got back! 🙂 These kiss-in-the-cookies are so perfectly Fall- they would be so pretty on a Thanksgiving buffet! And, as always, your photography is stunning.